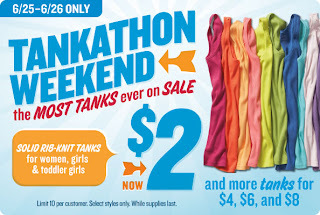 Now through Sunday, Old Navy has tanks for $2 in-store only (Reg $8.50 - $19.94). No coupon is needed for this sale. Go here to get a $5 off $35 in-store coupon. 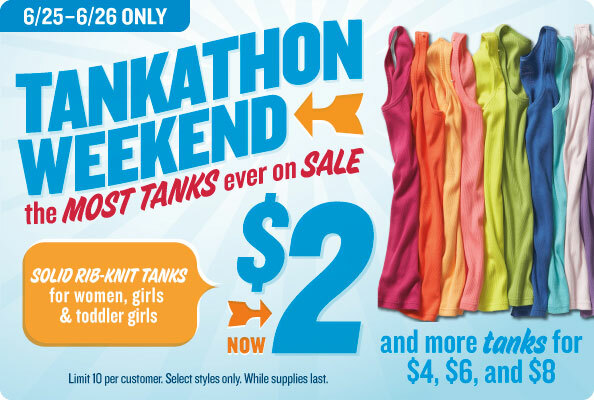 O get a 10% off your purchase printable in-store coupon at Old Navy's Facebook page. Click on the Hottest Ticket link on the left hand side. Note, you will not be able to view the coupon if your Account Settings will only allow https sites. You'll need to change this in Account Settings to get the coupon.